They have helped to transform a stable foreman into a G1 trainer; they’ve helped old racehorses find new homes; and they’ve given strength and encouragement to the thousands who perform everyday work in stables and on studs across Australia. 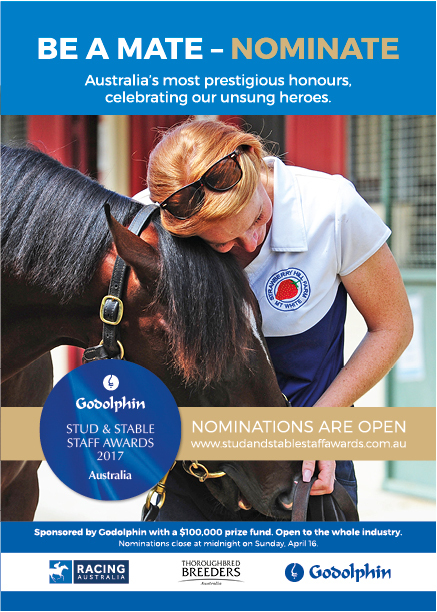 In 2017, the Godolphin Stud and Stable Staff Awards will again recognise those whose efforts go largely unnoticed and whose work is as vital as any other to the success and survival of the racing and breeding industries. The Awards conducted by Racing Australia and Thoroughbred Breeders Australia will again honour workers in the stud and stable categories of Leadership, Dedication to Racing, Dedication to Breeding, Horsemanship and Thoroughbred Care and Welfare, plus a further category of Administration and Ancillary Services. An overall Thoroughbred Excellence winner is chosen from the five stud and stable section winners. Since their inception in Australia in 2015, the Awards have acknowledged outstanding talent, contribution and dedication, not only among the winners, but all who entered. For one-time stable foreman, Mark Newnham, the inaugural Excellence Award winner in 2015, the GSSSA helped provide both the confidence and the means to set up a racing stable that produced a G1 Golden Slipper runner in its first full year of operation. “When you’re starting out you need plenty of help, financial and otherwise, and that’s what the Awards gave me,” Newnham said. “But most of all it’s the recognition. So many of the entrants are people who start work before dawn and do some of the toughest jobs in the business. The 2016 Thoroughbred Excellence Award winner Jenny Watson, the foaling supervisor at Armidale Stud in Tasmania, echoed those sentiments. “There are so many good people out there who deserve recognition, I’m just thrilled to be one of them,” she said. Each GSSSA winner receives $10,000 with $1000 going to the runners-up and $3000 to be shared among each winner’s work colleagues. The Thoroughbred Excellence Award carries an additional $5000 prize. Nominations are now open and close on Sunday April 16, 2017.